Dementia is largely a disease of older adults, but 2% of individuals affected are <65 years old (Samson, Warren, & Rossor, 2004). Frontotemporal dementia (FTD) constitutes 10% to 20% of dementia in younger (age <65 years) individuals (Samson et al., 2004). Individuals with neuronal degeneration in their frontal and temporal lobes demonstrate a decline in social conduct, apathy, and loss of insight that is gradual and progressive (Dickerson, 2014). An estimated 48 million individuals worldwide have a diagnosis of dementia, with an incidence of 9.9 million new cases annually (Ferri et al., 2005; Prince et al., 2013; Samson et al., 2004). Individuals with dementia in residential care are often inactive due to institutional routines and overreliance on the help of staff members, which may lead to physical disablement (Morgan-Brown & Brangan, 2016). In terms of maximizing potential for health and happiness, it has been suggested that person-centered non-traditional facilities outperform traditional facilities in potential opportunities for staff interactions and environmental engagement (Richards, D'Cruz, Harman, & Stagnitti, 2015). Person-centered care has evolved as an alternative to traditional medical care, with a focus on individuals' need to be included and involved in past and current interests for sources of fulfillment and satisfaction (Kitwood & Bredin, 1992). One important strategy in implementing person-centered care is to transform the physical institutional environment to a more homelike environment and to introduce activities that meet individuals' unique needs (Brooker, 2006). The effect of methods such as cognitive training and rehabilitation in Alzheimer's disease (AD) and vascular dementia are poor, whereas reminiscence therapy may reduce stress and improve patients' functional ability (Bahar-Fuchs, Clare, & Woods, 2013; Woods, Spector, Jones, Orrell, & Davies, 2005). There is little evidence for effective interventions to maintain physical function and mediate behavior changes in individuals with AD and vascular dementia (Edwards, Gardiner, Ritchie, Baldwin, & Sands, 2008). Although rare, the existing research indicates that physical activity may reduce subjective caregiver burden associated with care for individuals with dementia and exercise may reduce negative effects in individuals with moderate to severe dementia, such as the degree of anxiety and depression (Edwards et al., 2008; Orgeta & Miranda-Castillo, 2014). One goal in progressed dementia care is to reduce behavior that could indicate discomfort and mental distress. One strategy used is music therapy, in which the therapist seeks to reduce symptoms and strengthen emotional regulation through rhythm and music (Kung, Chen, Zatorre, & Penhune, 2013; Moore, 2013). Music therapy comprises elements such as singing, moving/dancing to music, listening to music, or playing musical instruments. While singing, the structure of the rhythm influences activation patterns and intensity of activation. The basic activity of singing rhythmic sequences activates the bilateral supplementary motor area; premotor cortex, more distinct in the left hemisphere; left cingulate gyrus; and right basal ganglia, and has been documented as stimulating hemispheric specialization (Jungblut, Huber, Pustelniakc, & Schnitker, 2012). In individuals with dementia, singing may encourage reminiscence and memories of the past, as well as reduce anxiety and fear (Li, Wang, Chou, & Chen, 2015). Studies that include music therapy have focused on individuals with minor to moderate cognitive decline who are not institutionalized (Adam, Ramli, & Shahar, 2016). The results are promising, indicating that less anxiety and depression are experienced in individuals undergoing music therapy (Adam et al., 2016). However, how and when to use music therapy to moderate behavior and facilitate performance is not clear. The use of music is described as the tacit knowledge of experienced staff, and strategies are not usually described or documented in medical care records. In the current study, the focus was on promoting a combination of music therapy and physical activity with the goal of reducing anxiety, restlessness, irritability, and aggression in individuals with dementia in institutional care with a mixture of symptoms, including frontal lobe problems. The current study used an exploratory design including a combined intervention for individuals with severe dementia in an institutional special care unit. Individuals with dementia and signs of frontal lobe problems who had resided for at least 6 months in a special care dementia unit in a nursing home were the target for the study. Possible participants were identified by the institution's department manager. Individuals with dementia included in the study were Norwegian citizens (four men and two women), with a mean age of 84.3 years (Table 1). All participants had completed either high school or college and had been married, and most (n = 5) had children and grandchildren. Participants were residents in the special care dementia unit at the nursing home due to irritable, boisterous, and verbally and/or physically threatening behavior, with a mean length of stay of 2.5 years. All participants were ambulant indoors, four independently and two with support. One participant could also walk outdoors with assistance. Participants' cognitive status and aggressive behavior had deteriorated over the years, and participants were relocated to the special unit after clinical evaluations by the nurses in charge. Diagnoses varied: three participants were diagnosed with AD and three with vascular dementia, all with frontal lobe affection. Frontal lobe affection was the main reason for being in the special care dementia unit and for inclusion in the current study (Table 1). In addition, participants' primary caretakers (n = 6) were recruited as informants. Primary caretakers were nurse assistants with formal education, and with varying levels of experience. They represented a multinational team with backgrounds from Norway, Sri Lanka, Philippines, and Ethiopia. The nursing home comprised two houses, each five stories high, situated in a densely populated area of the city with no green areas for recreation. Consequently, opportunities for outdoor activities were limited. The doors and elevator within the building that housed the dementia department were locked. To move about freely between wards, a special code had to be used to unlock the doors. Wards with special units for individuals with severe dementia were situated on different floors than other wards, with locks between the floors, doors, and elevators. Each ward had two wings with corridors of rooms for residents, separated by the nurses' quarters, elevators, and rooms for recreation and dining in the middle. A combination of physical activity, music, and walking was systematically implemented on a regular schedule for 8 weeks based on the available choices of music-related activities in the institution. During the intervention, participants were scheduled to complete the activities and their primary caretakers were asked to implement music therapy in their daily care, such as during morning care. Thus, a combination of obligatory activities that differed from the usual voluntary activities in form and consistency were systematically implemented. The goal was to release individuals' energy and to reduce restless, irritable, or aggressive behavior. Activities included different forms of physical activity, music therapy, and walking outdoors. Physical Activity. Physical activity was defined as any bodily movement produced by skeletal muscles that requires using energy and leads to energy consumption higher than that at rest, such as during sitting or lying in bed (Bouchard, Shepherd, & Stephens, 1994). Physical activity sessions, led by a physiotherapist, were in standardized doses with frequencies of two to three times per week each 30 to 45 minutes in duration. The physical activity session mainly included activities or movements such as sitting and standing balance activities, stretching, strengthening exercises, breathing exercises, and different sport activities with balls and other objects. In total, each patient could participate 16 to 24 times. Music Therapy. Music therapy was defined as singing, listening to music, moving/dancing to music, or playing musical instruments. Music was individually tailored to suit participants' taste. Movements/dance were intended to enhance individuals' sense of rhythm and increase sensory input. Individual or group music sessions were offered once per week, and were a total of 45 minutes long and led by a music therapist. Sessions included activities or movements such as singing, playing musical instruments, moving to the music, or simply listening to enhance relaxation. A music session could also be divided into smaller periods and used in combination with other daily activities such as while getting dressed, preparing for bathroom activities, or combined with walking; these small sessions were led by participants' primary caretakers. Walking. The walking exercise aimed to improve or maintain one or several components of physical capacity (Bouchard et al., 1994). The activity was performed at preferred walking speed, and participants were given the choice of walking indoors or outdoors. The out-and-about walking session was offered for a total of 45 minutes per week together with a staff member or, if possible and desired, by the patient alone. Primary caretakers were familiar with the tests and the scoring of tests. Consequently, only a short review of outcome measures was necessary before baseline tests to standardize the testing procedure. Quantitative Evaluations. Brøset Violence Checklist. The Brøset Violence Checklist (BVC) assesses the presence of six observable patient behaviors, including whether the patient is confused, irritable, boisterous, verbally threatening, physically threatening, and/or attacking objects (Abderhalden et al., 2004). A summed score of 0 indicates that the risk of violence is small; 1 to 2 indicates that the risk of violence is moderate and preventive measures should be taken; and a score >2 indicates that the risk of violence is high, preventive measures should be taken, and plans should be made to manage a possible attack. The reported discriminatory ability is good, with a correct prediction rate of approximately 85% (Abderhalden et al., 2004). Assessments were made at baseline, and then daily for the 8 weeks of intervention, by the primary caretaker. 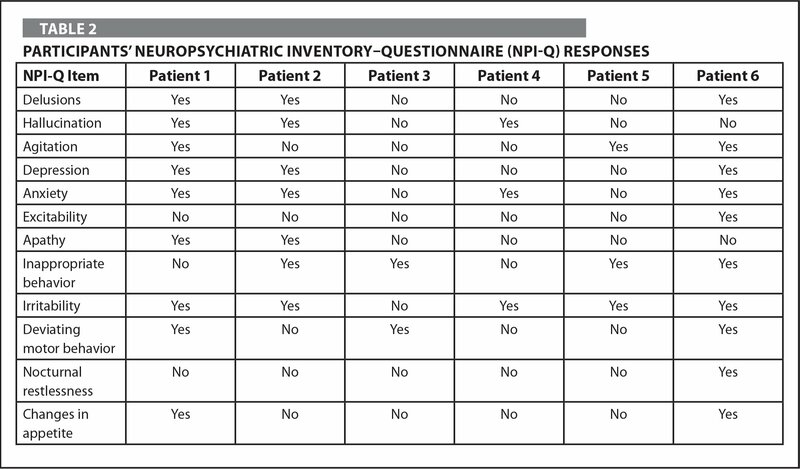 Neuropsychiatric Inventory– Questionnaire (NPI-Q). The NPI-Q is a clinical instrument for assessing behavioral and psychological symptoms in individuals with dementia (Kaufer et al., 2000). It is cross-validated with the standard NPI to provide a brief assessment of neuropsychiatric symptoms in routine clinical settings (Kaufer et al., 2000). The NPI-Q is adapted from the NPI (Cummings, 1997), a validated informant-based interview that assesses neuropsychiatric symptoms over the previous 1 month. Assessments were made by the primary caretaker at baseline. Registration. The primary caretaker (nurse assistant) documented compliance to the program by recording weekly activities in a logbook. Descriptive data, such as age, gender, education, years spent in the dementia ward, and comorbidities, were collected from the institution's documentation system. Qualitative Evaluations. Semi-structured interviews with primary caretakers were performed at baseline and at the end of the 8-week interventions. Interviews were approximately 40 to 45 minutes long. The purpose of the interviews was to obtain a description of observed behavior in individuals with dementia and to interpret any possible subjective benefits of the intervention program (Kvale & Brinkmann, 2009). Primary caretakers were asked to what extent they believed the program and activities had been helpful in meeting the challenges of daily care, and whether there were any other strategies primary caretakers had found useful in reducing patients' restless and sometimes violent behavior. Descriptive data are presented as raw data, in addition to mean and median where appropriate. NPI at baseline was categorized according to symptoms (present or not present). BVC was presented as the total score for all items for each participant over the 8 weeks and as pre- and postintervention scores. Researchers used the one sample Kolmogorov–Smirnov test to test for normality. Researchers continued with non-parametric tests because of small sample size (N = 6). Overall scores were analyzed with the Kruskal-Wallis test for differences in the whole sample at baseline. A non-parametric Wilcoxon signed rank test was used to evaluate individual difference between pre- and postintervention scores of the BVC, with p < 0.05 (Altman, 2001). integrating the insights from the condensed meaning units into generalized descriptions that reflect significant factors. The analytic focus was on how primary caretakers described participants with dementia before and after the intervention in view of observed restlessness, violent or inappropriate behavior, and activity levels. Descriptions were analyzed in view of theoretical constructs of music therapy and physical activity and discussed according to existing studies on the subject (Kvale & Brinkmann, 2009). The project was submitted to the Regional Committees for Medical and Health Research Ethics (REK), but was considered to be outside the remit of the Act on Medical and Health Research and could therefore be implemented without the approval of the REK. The Norwegian Centre for Research Data approved and registered the project in 2012. The department manager of the institution identified possible participants, and participants' family members were approached with information about the project to invite them to participate in the study and sign the written agreement on behalf of their relatives with severe dementia. Although participants were frail, the primary caretakers involved had great experience and knew the participants well, which was a prerequisite of participating in the study. Participants' behavior differed, ranging from severe physical aggression to combinations of delusion, confusion, hallucination, agitation, and depression in addition to restlessness/wandering according to baseline NPI-Q (Table 2). The items confusion, irritability, and verbal threats were the most prominent features presented in the BVC (Table 3). 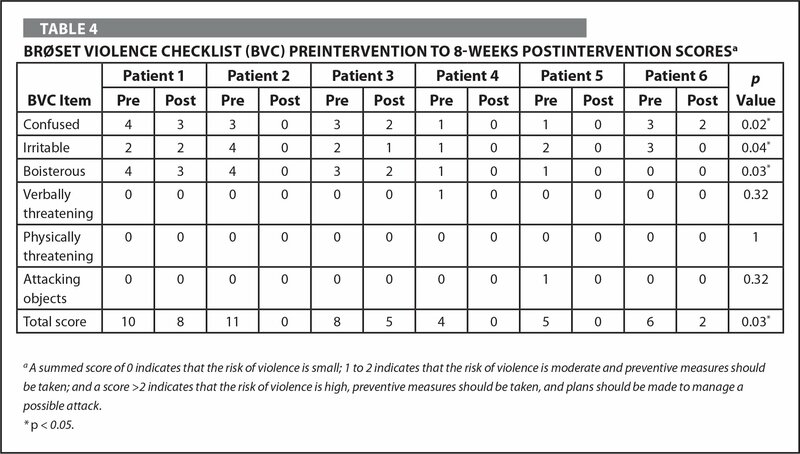 Participants averaged a mean score on the BVC ranging from 2.2 to 8.0 during the 8 weeks of the intervention, indicating that risk of violence was high and preventive measures and plans regarding how to manage aggressive behavior should be made (Table 3). Individual BVC scores, in contrast, indicated a tendency to improve during the intervention period, ranging from 0 to 11 at baseline to 0 to 8 at 8 weeks (Table 4). However, primary caretakers in the interviews before and after the interventions did not report any observable changes, despite a lower reported score on the BVC (Table 3 and Table 4). Other existing welfare opportunities, such as social gatherings, reading activities, and helping to prepare dinner, set the table, and more, were offered daily during the 8 weeks. Participants participated in these welfare activities between 6 and 33 times in addition to the combined music and physical activity intervention. We have activities for the residents every day and you could say that song and music are key points in these activities. But we also have nail care, massage, concerts, and reading groups with reading aloud. These are very popular activities in the nursing home. [Patient 3] is always very active and he likes to participate in everything that goes on in the house. So when the project was going on he was less confused, but he was bored in the evenings when the activities stopped. [Patient 4] is very particular when it comes to music—he is critical of the performance and he comments aloud and shows his annoyance. He does not like it when we play the same music repeatedly. But most important, at least I think so, is one-to-one contact. That is best for [Patient 4]—on his terms. Moreover, when he is not “present” nothing will do, because then he is only in pain and sorrow. 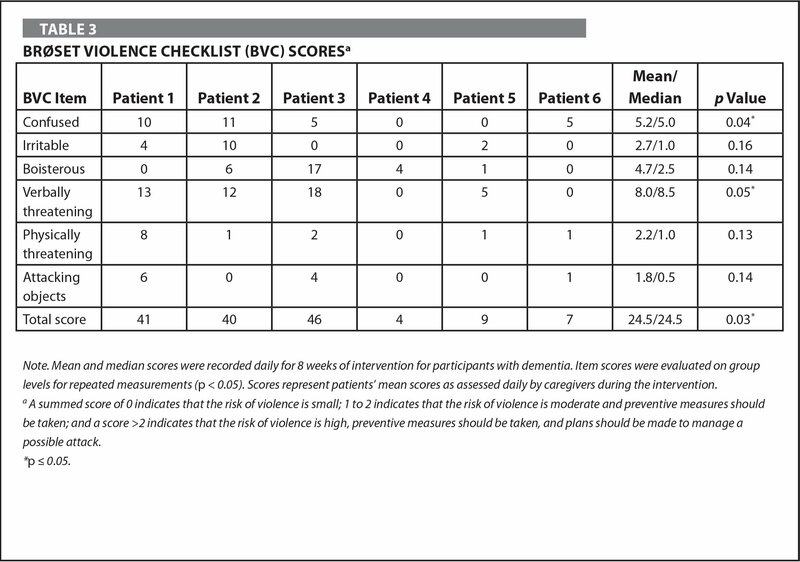 The current study of a combined systemized music and physical activity intervention for six individuals with severe dementia for 8 weeks indicates a shift toward less violent behavior postintervention in all participants according to the BVC (Table 3 and Table 4). Routine reports of the special care dementia unit showed that participants were on stable medication for the period of the systematic intervention. However, results must be interpreted with caution, as the current study is a small case study with only six participants with a mix of dementia types. An interesting finding was that primary caretakers did not report changes of behavior in the interviews postintervention. This is in contrast to results of the BVC, which was filled in every day during the 8 weeks by the same person and indicated that patients were calmer postintervention. One explanation may be that staff members slowly adapt to the change of behavior over time, giving rise to a difference between objective and subjective measures in a longitudinal perspective. In addition, lack of reporting could also be due to the difference in behavior being so small that it may not be considered clinically relevant (Coley, Gallini, Ousset, Vellas, & Andrieu, 2016). Music therapy has been tested in other settings with individuals with AD, with results indicating compliance and positive influence of the intervention (Edwards et al., 2008; Kung et al., 2013; Orgeta & Miranda-Castillo, 2014). In general, individuals participating in the aforementioned studies were in a less progressed stage of dementia and were functioning slightly better cognitively than individuals in the current study. The level of cognitive decline and time from the onset of cognitive decline seem to influence the impact music therapy and physical activity may have on cognition and restlessness (Edwards et al., 2008; Jungblut et al., 2012; Kung et al., 2013; Li et al., 2015; Orgeta & Miranda-Castillo, 2014; Ozdemir, Norton, & Schlaug, 2006; Ridder, 2005). It is possible that a slightly younger group of participants with a higher level of cognition would have been more receptive to the intervention than participants in the current study. The systemization and tailoring of appropriate music therapy and maintenance of physical activity for frail institutionalized older adults with severe dementia may be more intricate and sensitive than anticipated, taking into account personal preferences and availability of choice. The intricate and sensitive process of tailoring the intervention may have influenced the results and the length of the intervention. As demonstrated in the current study, it is difficult to maintain a standardized music therapy program over time in patients with severe dementia, which is reflected in the relatively poor compliance to the intervention in the current study. The results are in line with similar studies in individuals with dementia (Lowery et al., 2014). As a complement to other methods such as cognitive training and reminiscence therapy, which may also reduce stress and improve patients' functional ability, combined physical activity and music therapy seem to be promising tools. Health issues, comorbidities, and daily variations in patients' physical and mental condition may influence patients' motivation for participating and ability to participate in activities. This finding was illustrated by several participants who experienced painful conditions, incontinence, and other physical limitations that could vary from day to day. In addition, participants were older adults with a mean age of 84.3 years, and the aging process itself may have diminished their motivation to participate in activity (Tornstam, 2005). Lastly, participants had been residents in a geriatric institution for many years before the current project; thus, the institution represents their home. Participants may have formed and fermented a way of life in the institution. The ability to change and adapt to a new mode of behavior may be difficult and even detrimental, as routines represent comfort and safety. However, participants were diverse and some indicated a need for change and to get out and about; however, less structured outings and activities may have been more beneficial. In addition, patients' personal needs for rest or activity often conflicted with the institution's schedule, which had certain routines due to structure of the building and wards, shift work, and, frequently, lack of staff. It is evident that to implement interventions in this frail group of individuals, a highly competent staff, which can interpret and accommodate signals and needs of individuals with dementia, is vital. Competence-building may be an important key to improving care. In addition, to facilitate optimal physical and cognitive functioning for individuals with dementia, it may also be necessary to adapt the environment to promote activity more than the current researchers were able. Implementation of a systematic combination of music and a physical activity program was feasible in a group of individuals with severe dementia, and helped reduce anxiety, restlessness, irritability, and aggression. Altman, D.G. (2001). Practical statistics for medical research. London, UK: Chapman & Hall/CRC. Bouchard, C., Shephard, R.J. & Stephens, T. (Eds.) (1994). Physical activity, fitness, and health: International proceedings and consensus statement. Champaign, IL: Human Kinetics. Brooker, D. (2006). Person-centred dementia care: Making services better. London, UK: Jessica Kingsley. Dickerson, B.C. (2014). Frontotemporal dementia. In Dickerson, B. & Alireza, A. (Eds. ),Dementia: Comprehensive principles and practice (pp. 176–197). Oxford, UK: Oxford University Press. Kvale, S. & Brinkmann, S. (2009). Learning the craft of qualitative research interviewing (2nd ed.). Los Angeles, CA: Sage. Ridder, H.M.O. (2005). An overview of therapeutic initiatives when working with persons suffering from dementia. In Aldridge, D. (Ed. ), Music therapy in neurological health care settings (pp. 61–82). London, UK: Jessica Kingsley. Tornstam, L. (2005). Gerotranscendence: A developmental theory of positive aging. New York, NY: Springer. Dr. Langhammer is Professor, Dr. Sagbakken is Associate Professor, Dr. Nåden is Professor, and Dr. Rognstad is Professor, Oslo Metropolitan University, Faculty of Health Sciences, Oslo; Dr. Kvaal is Professor, Inland Norway University of Applied Sciences, Faculty of Health and Social Health, Elverum; and Dr. Ulstein is Physician and Geriatrics Specialist, Oslo University Hospital, Department of Geriatric Medicine, Oslo, Norway. Dr. Langhammer is also Professor, Sunnaas Rehabilitation Hospital, Bjørnemyrveien, Nesoddtangen, Norway. The authors thank the personnel and participants at Silurveien sykehjem, Oslo, Norway nursing home for their valuable help and contribution to this study. Address correspondence to Birgitta Langhammer, PhD, RPT, Professor, Oslo Metropolitan University, Faculty of Health Sciences, Box 4 St. Olavs Plass, 0130 Oslo, Norway; e-mail: Birgitta.Langhammer@oslomet.no.